'It looks as if we were coming to a village,' said the Mole somewhat dubiously, slackening his pace, as the track, that had in time become a path and then had developed into a lane, now handed them over to the charge of a well-metalled road. The animals did not hold with villages, and their own highways, thickly frequented as they were, took an independent course, regardless of church, post office, or public-house. But it was from one little window, with its blind drawn down, a mere blank transparency on the night, that the sense of home and the little curtained world within walls—the larger stressful world of outside Nature shut out and forgotten—most pulsated. Close against the white blind hung a bird-cage, clearly silhouetted, every wire, perch, and appurtenance distinct and recognisable, even to yesterday's dull-edged lump of sugar. On the middle perch the fluffy occupant, head tucked well into feathers, seemed so near to them as to be easily stroked, had they tried; even the delicate tips of his plumped-out plumage pencilled plainly on the illuminated screen. As they looked, the sleepy little fellow stirred uneasily, woke, shook himself, and raised his head. They could see the gape of his tiny beak as he yawned in a bored sort of way, looked round, and then settled his head into his back again, while the ruffled feathers gradually subsided into perfect stillness. Then a gust of bitter wind took them in the back of the neck, a small sting of frozen sleet on the skin woke them as from a dream, and they knew their toes to be cold and their legs tired, and their own home distant a weary way. We others, who have long lost the more subtle of the physical senses, have not even proper terms to express an animal's inter-communications with his surroundings, living or otherwise, and have only the word 'smell,' for instance, to include the whole range of delicate thrills which murmur in the nose of the animal night and day, summoning, warning, inciting, repelling. It was one of these mysterious fairy calls from out the void that suddenly reached Mole in the darkness, making him tingle through and through with its very familiar appeal, even while yet he could not clearly remember what it was. He stopped dead in his tracks, his nose searching hither and thither in its efforts to recapture the fine filament, the telegraphic current, that had so strongly moved him. A moment, and he had caught it again; and with it this time came recollection in fullest flood. 'Oh, COME along, Mole, do!' replied the Rat cheerfully, still plodding along. The Rat was by this time very far ahead, too far to hear clearly what the Mole was calling, too far to catch the sharp note of painful appeal in his voice. And he was much taken up with the weather, for he too could smell something—something suspiciously like approaching snow. 'Mole, we mustn't stop now, really!' he called back. 'We'll come for it to-morrow, whatever it is you've found. But I daren't stop now—it's late, and the snow's coming on again, and I'm not sure of the way! And I want your nose, Mole, so come on quick, there's a good fellow!' And the Rat pressed forward on his way without waiting for an answer. He waited till Mole's sobs became gradually less stormy and more rhythmical; he waited till at last sniffs were frequent and sobs only intermittent. Then he rose from his seat, and, remarking carelessly, 'Well, now we'd really better be getting on, old chap!' set off up the road again, over the toilsome way they had come. 'Wherever are you (hic) going to (hic), Ratty?' cried the tearful Mole, looking up in alarm. It was close and airless, and the earthy smell was strong, and it seemed a long time to Rat ere the passage ended and he could stand erect and stretch and shake himself. The Mole struck a match, and by its light the Rat saw that they were standing in an open space, neatly swept and sanded underfoot, and directly facing them was Mole's little front door, with 'Mole End' painted, in Gothic lettering, over the bell-pull at the side. Mole reached down a lantern from a nail on the wail and lit it... and the Rat, looking round him, saw that they were in a sort of fore-court. A garden-seat stood on one side of the door, and on the other a roller; for the Mole, who was a tidy animal when at home, could not stand having his ground kicked up by other animals into little runs that ended in earth-heaps. On the walls hung wire baskets with ferns in them, alternating with brackets carrying plaster statuary—Garibaldi, and the infant Samuel, and Queen Victoria, and other heroes of modern Italy. Down on one side of the forecourt ran a skittle-alley, with benches along it and little wooden tables marked with rings that hinted at beer-mugs. In the middle was a small round pond containing gold-fish and surrounded by a cockle-shell border. Out of the centre of the pond rose a fanciful erection clothed in more cockle-shells and topped by a large silvered glass ball that reflected everything all wrong and had a very pleasing effect. They went and foraged accordingly, hunting through every cupboard and turning out every drawer. The result was not so very depressing after all, though of course it might have been better; a tin of sardines—a box of captain's biscuits, nearly full—and a German sausage encased in silver paper. 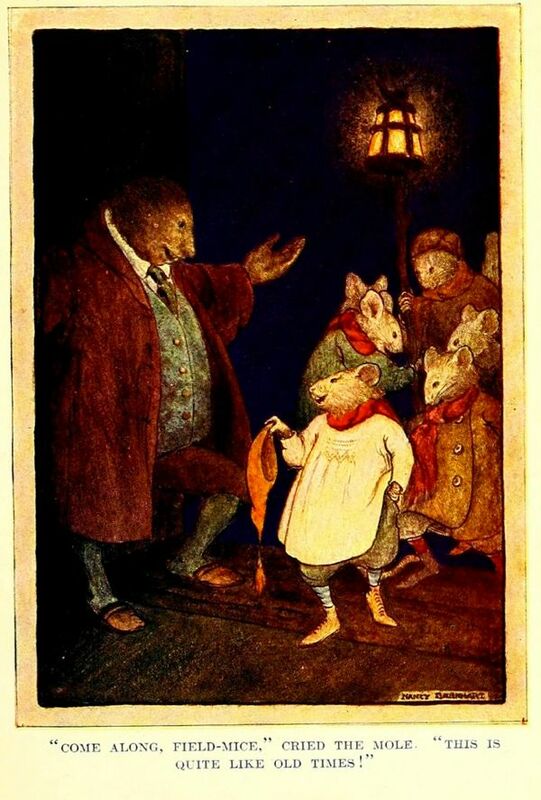 Then, while the Rat busied himself fetching plates, and knives and forks, and mustard which he mixed in an egg-cup, the Mole, his bosom still heaving with the stress of his recent emotion, related—somewhat shyly at first, but with more freedom as he warmed to his subject—how this was planned, and how that was thought out, and how this was got through a windfall from an aunt, and that was a wonderful find and a bargain, and this other thing was bought out of laborious savings and a certain amount of 'going without.' His spirits finally quite restored, he must needs go and caress his possessions, and take a lamp and show off their points to his visitor and expatiate on them, quite forgetful of the supper they both so much needed; Rat, who was desperately hungry but strove to conceal it, nodding seriously, examining with a puckered brow, and saying, 'wonderful,' and 'most remarkable,' at intervals, when the chance for an observation was given him. 'Who were the first to cry NOWELL? Here much muttered conversation ensued, and the Mole only heard bits of it, such as—'Fresh, mind!—no, a pound of that will do—see you get Buggins's, for I won't have any other—no, only the best—if you can't get it there, try somewhere else—yes, of course, home-made, no tinned stuff—well then, do the best you can!' Finally, there was a chink of coin passing from paw to paw, the field-mouse was provided with an ample basket for his purchases, and off he hurried, he and his lantern. There was no more talk of play-acting once the very real and solid contents of the basket had been tumbled out on the table. Under the generalship of Rat, everybody was set to do something or to fetch something. In a very few minutes supper was ready, and Mole, as he took the head of the table in a sort of a dream, saw a lately barren board set thick with savoury comforts; saw his little friends' faces brighten and beam as they fell to without delay; and then let himself loose—for he was famished indeed—on the provender so magically provided, thinking what a happy home-coming this had turned out, after all. As they ate, they talked of old times, and the field-mice gave him the local gossip up to date, and answered as well as they could the hundred questions he had to ask them. The Rat said little or nothing, only taking care that each guest had what he wanted, and plenty of it, and that Mole had no trouble or anxiety about anything. The weary Mole also was glad to turn in without delay, and soon had his head on his pillow, in great joy and contentment. But ere he closed his eyes he let them wander round his old room, mellow in the glow of the firelight that played or rested on familiar and friendly things which had long been unconsciously a part of him, and now smilingly received him back, without rancour. He was now in just the frame of mind that the tactful Rat had quietly worked to bring about in him. He saw clearly how plain and simple—how narrow, even—it all was; but clearly, too, how much it all meant to him, and the special value of some such anchorage in one's existence. He did not at all want to abandon the new life and its splendid spaces, to turn his back on sun and air and all they offered him and creep home and stay there; the upper world was all too strong, it called to him still, even down there, and he knew he must return to the larger stage. But it was good to think he had this to come back to; this place which was all his own, these things which were so glad to see him again and could always be counted upon for the same simple welcome.